It’s happened again. Yesterday I read another article quoting a North American port official saying how strong their port’s demand for cruises is and they are expecting to have an additional cruise ship homeported there in the not-too-distant future. Could these people be so myopic they don’t see what is happening in the cruise industry globally? Or are they intentionally misleading their local market? A Caribbean Princess passenger died Thursday morning while on a snorkeling excursion at Belize. The local Tourism Police said the woman was snorkeling off Sargent’s Caye when she suddenly went under water. The police superintendent said the 67-year-old woman was pulled from the water relatively quickly but could not be revived. Holland America today issued the third video in their “Countdown to Koningsdam” series. This on focuses on the ship’s main theater, the World Stage, and features Bill Price, the line’s Director of Entertainment. Koningsdam’s theater will be rather unique with a round stage and LED screens that surround the audience 270 degrees. Koningsdam is almost here. It will enter service in April. The US State Department has issued their strongest and most specific warning to US citizens to date regarding travel to Nassau, and yet the cruise industry is doing nothing about it, except admonishing passengers to be careful. The warning was precipitated by another US citizen alleging a sexual assault by jet-ski operator in Nassau on January 2. This is the fifth since July 2014, with more by women of other nationalities. Details appeared in the January 7 edition of Cruise News Daily. Several years ago we told readers how cruise ships were probably going to be used more in the future to import drugs because there seemed to be rather lax surveillance and customs enforcement surrounding them. We’ve been reporting from time to time over the last couple of years on a growing number of instances of crew members being arrested after picking up drugs in one port and then taking them ashore in another, in this case in New Orleans. This week, Norwegian Dawn is four crew members short as they were arrested by federal agents last Sunday in New Orleans during an attempt to bring about ten pounds of cocaine into the US. What’s interesting about this case is that in the complaint, presented in federal court this week, it reveals a bit about how the Homeland Security agents work. The other aspect that is always amazing is that the crew members carried the drugs to the US aboard the ship, meaning that the security people at NCL who are so meticulous about finding even small amounts of your favorite beverage that you may want to bring aboard the ship unnoticed, allow crew members to bring three-pound packages of cocaine aboard the ship stuffed in their underwear and never notice. The complete story appeared in the January 7 edition of Cruise News Daily. Last week we told you that it appeared Royal Caribbean was getting ready to charge for the North Star and Ripcord by iFly attractions on Quantum of the Seas and probably on Anthem of the Seas, because the line had posted pricing and the reservation mechanism was set up for Quantum sailings from China. We couldn’t tell you exactly where things were going because nobody from Royal Caribbean seemed to want to talk to us about it. Now we can tell you what Royal Caribbean is thinking because Vicki Freed, Royal Caribbean’s SVP of Sales and Trade Support & Service, talked with CND yesterday. The complete story appeared in the January 6 edition of Cruise News Daily. Key West is starting to feel the results of a decision they made a couple of years ago. Passenger numbers at the port are falling. They are down almost 7% in the last fiscal year. Details appeared in the January 6 edition of Cruise News Daily. It’s January, and every year that brings a flurry of world cruise sailings. Tomorrow is one of those days when a ship full of passengers sailing on an extensive itinerary departs on a voyage, usually around three months long. The most ambitious of these completely circumnavigate the world. Costa Luminosa sails out of Savona (near Genoa) on a 108-day cruise that will completely circle the globe and return to Savona on April 24. Windstar said today they are now canceling all Star Pride sailings through April 9. The ship is still awaiting repair from the December 22 grounding off the coast of the Panamanian island of Isla de Coiba. Norwegian Cruise Line's new advertising campaign, "Feel Free," launched yesterday (January 4) and contains an unreleased Pitbull song called "I'm Free." On every cruise line that offers it, the chef's table is an experience - a very nice experience, indeed, but on select ships, Royal Caribbean elevates the experience further - with the White Truffle Chef's Table. Back in September when Genting Hong Kong announced their purchase of the majority stake in German shipbuilder Lloyd Werft Bremerhaven and its real estate affiliate Lloyd Investitions und Verwaltungs, they said they retained an option to purchase the remaining shares. Today they said they were exercising that option. Where were you on New Year’s Eve? If you were one of MSC’s passengers in South America, chances are 100% you were in the place to be - on Rio’s Copacabana Beach. 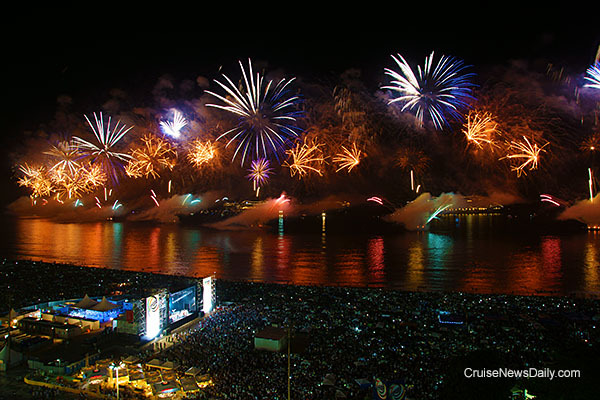 As the largest cruise operator in the rapidly expanding South American market, MSC had four of their ships there, and they all had a front row “seat” for the spectacular NYE fireworks display above the beach. Beyond the smoke from the fireworks, four MSC ships are anchored.